Environmental Hazards from Offshore Methane Hydrate Operations presents the first treatment of the legal issues facing the future of offshore methane hydrates, perhaps one of the largest known potential sources of fresh water and energy in the world today, taking into account both proprietary interests and environmental hazards. Although methane hydrates are not recent discoveries, it is only now that their extraction and production are becoming commercially feasible as a major new energy source. They are present offshore in almost every coastal state, and their economic potential for endowing those states with abundant natural gas is vast. 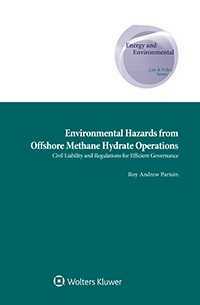 This book develops a theoretical foundation for a model regulatory framework for those challenges and then provides a comparative legal analysis of existing laws and conventions to determine their fitness for offshore methane hydrates related activities. private regulation and market-based incentives. As a road map to amending and revising existing laws and conventions, this book will be of inestimable practical value to policymakers in supporting the optimal risk governance of the development of methane hydrates. For potential entrepreneurs and operators, this book greatly reduces the legal uncertainty underlying their decision-making and investment decisions. Furthermore, this book enables a broad cross-section of legal practitioners and scholars to engage in this fascinating late arrival to the natural resources law and policy arena.